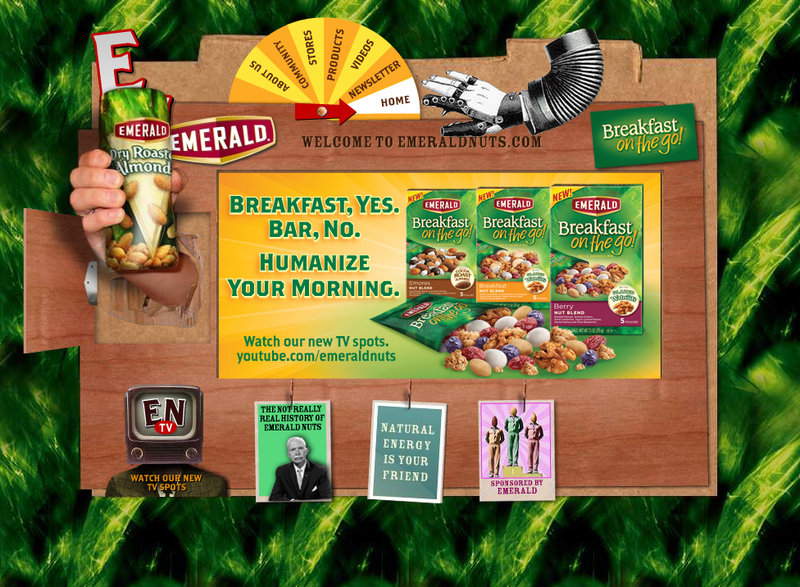 Emerald Nuts is running “Humanize Your Morning”, an advertising campaign for Breakfast on the Go pouches of granola, nuts and fruit. Aimed at people who currently eat breakfast bars, the campaign uses robots as the comedic foils to humans who are enjoying Breakfast on the Go. Robots appear in three spots, Cubebot, set in an office, “Commuterbot”, set in a train, and “MomBot”, set on a park bench. In each ad the robots can not get their positronic minds around an alternative to bars, ending up plastering their conversation partners with bar dust. The Humanize Your Morning campaign was developed at Deutsch LA by chief creative officer Mark Hunter, group creative director/copywriter Jason Elm, art director Bernie O’Dowd and copywriter Jeff Candido. Filming was shot by The Perlorian Brothers via Furlined. Editing was by Matthew Wood at The Whitehouse Post. Post production was done at New Hat. Special effects were produced at Therapy Studios, Los Angeles. Audio post production and sound design was done at 740 Sound Design. The robots were constructed at Legacy Effects. The goal was to produce “an old-fashioned style robot that would show the awkwardness of the robot compared to the vitality of the actors and the Emerald nut [blend],” Legacy Effects producer Alan Scott explained. “The design and movement of the robot needed to convey the cumbersome and stiffness of an awkward character and needed to be clunky, noisy and mechanical.” The robot was designed in 3-D modeling programs and custom fit to a digital scan of the suit performer. Once modeled, the parts were prototyped and then hand finished by the Legacy team. The robot is made from Vacu-formed plastics, fiberglass and rubber. The head had interchangeable mouth mechanisms designed to work with each type of breakfast bar that it needed to eat. A roller mouth was used for the jelly-filled bars, a grinder-style mouth for the harder granola bar and a woodchipper mouth for the softer rice/granola bar. It took three puppeteers to operate the robot. Effects coordinator and puppeteer Lindsay MacGowan was inside the robot’s body. Her vision was restricted, so she wore video goggles with a feed from a camera so she could make sure she hit her marks. Three other puppeteers—model shop supervisor Dave Merritt, key artist Robert Ramsdell and mechanic Hiroshi (Kan) Ikeuchi—worked the external controls for the robot’s mouth and antenna.